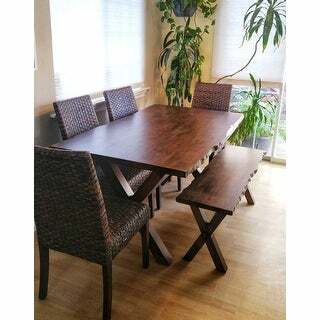 Beautifully made, top and legs are solid wood. Assembly was super easy. I love it. Complement your natural, country aesthetic with the Mandeville dining table from Simple Living. The solid rubberwood frame features a trendy x-shaped base and a sculptural, live edge. The rich, walnut finish will pair perfectly with any neutral or metallic accent. 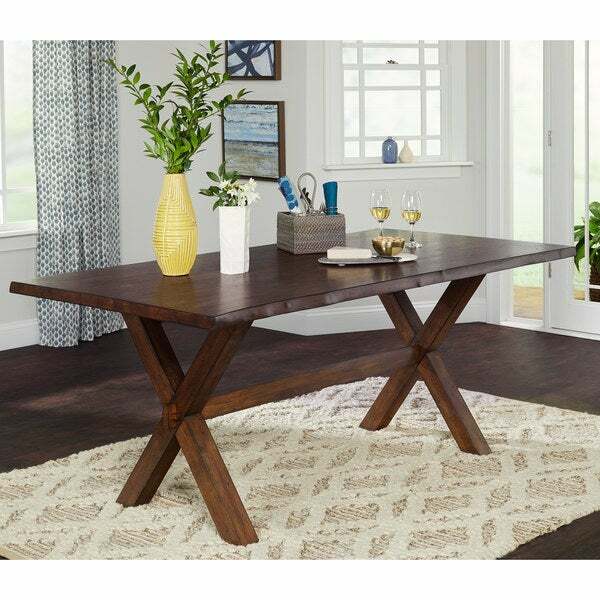 Overall a pretty, sturdy table but not high quality in the details. 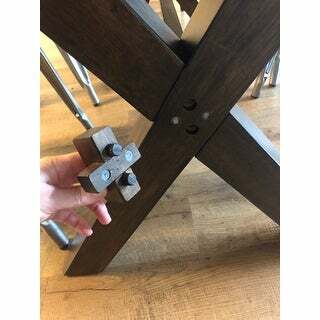 There are decorative pieces that are supposed to snap into the cross legs, but the plastic pegs broke on one side and don’t fit on the other. So the legs look a bit unfinished. Also, part of the “live edge” is missing; there’s about 18” on one side of the table that’s just regular table edge. This dining room table is exactly what I was looking for. It is heavy and well made and looks great in my space. 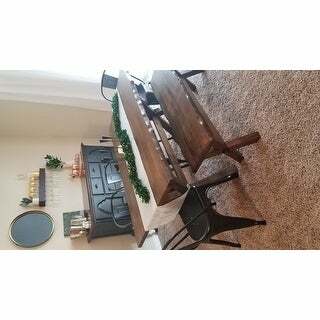 I live alone and have a smallish dining room so it works for me but if you are wanting a huge, show stopping dining room table, this is probably not the one. For what I was looking for, it’s perfect! Real wood, heavy, and sturdy... a rarity these days! Assembly was suprisingly simple. Definitely a good eat-in kitchen farmhouse table set. We ended up using it more than the one in our formal dining room. Great buy, solid construction! We love this table - the live edge is wonderful! Unfortunately, the table I received was damaged. There was a large chip on the side of the table and no sign of this chip in the packaging. This speaks poorly of the quality control as there was no evidence this damage occurred during the shipping process and was clearly sent to me this way. It took about a week longer than expected for this product to arrive. Due to slow shipping I decided to repair the product myself and given the style of the live edges it was easy to match and sand out the chip to an unnoticeable end result. 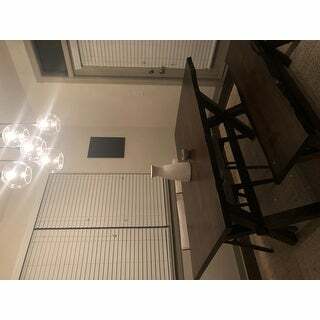 The table itself is sturdy, solid wood, and heavy. Construction was simple and took about 20 minutes. Would have been 5 stars if not for the damage to the product I received. Love the table! 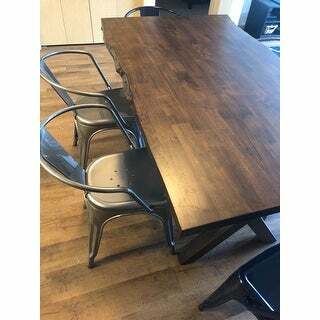 Great dark walnut color and thick solid wood. Assembly only took about 30 minutes and pretty easy (no power tools needed). Heavy, good quality materials. The only complaint is the knobs on the end/center of the X base are a little strange and could pop off eventually. Would definitely recommend this table, especially for the price. It’s a great table, very sturdy. I was able to put it together myself in an hour. The live edge is artificial but the walnut finish is pretty. Absolutely gorgeous! Very nice solid wood and easy to assemble. The detail of the living edge is perfect.Arrived on time and looks perfect in our new kitchen. Cool table! This is the closest thing we could find to work with settees for a booth style. Had a few light scratches, but wasn’t worth returning over. Just used a touch up marker.Very sturdy and holds up well with 2 young boys and their messes. Great value! The table and bench are gorgeous! Very heavy, nice quality, and easy to assemble. The only thing I struggled with were attaching the decorative pieces that cover the screws. I'm so thrilled with the 2 pieces though. 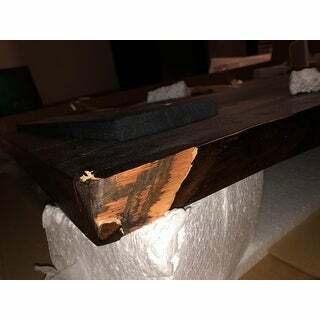 Product was delivered damaged- package was open and packaging material falling out, scrapes and dents to the edge/corners of the table. I reported the damage and provided photos and they tried to tell me somebody would have to come inspect it before they would provide a replacement. After sternly letting them know that was not acceptable, they ordered a replacement. Then today I got a notification that the replacement was delivered when it wasn't. After contacting customer service again, I was informed it was delivered to the wrong address. Now I have to wait at least another week for a 2nd replacement to be sent. 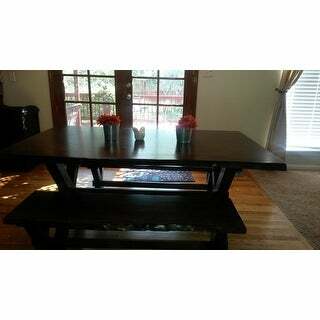 Table itself is heavy and sturdy and goes together easily. It would be very nice without the damage, especially being such an inexpensive item. This table is solid!! Easy to put together and looks beautiful! I’m in love with it and it looks even better in person than in the photo. The matching benches looks great with it. I also added metal chairs for a farmhouse look. It can match anything. 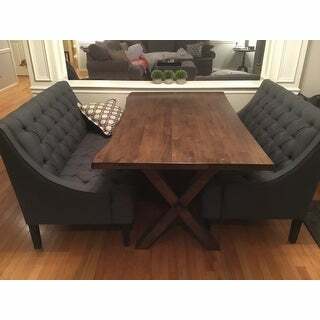 LOVE the quality of this table for the price! The actual tabletop is VERY heavy. I was a dummy and didn’t assemble it on top of the styrofoam it was packed with so I scratched up the surface a bit, but not very noticeable at all. I needed to upgrade from my 4-person table to accommodate my 6-person family and this for the bill perfectly. Highly recommend! This table is beautiful in person! Very simple, but great design. We wanted something medium-sized, but somewhat unique, that could blend into our other furniture well and this does the job. Beautiful table. Very sturdy. The live edge is gorgeous. 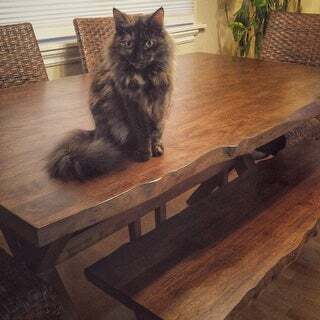 I’ve had several compliments on the table. It easily seats 6 people. It looks beautiful in our kitchen. Most visitors think it is much more expensive that what we paid for it. We got someone to assemble it but it was not difficult to assemble. Love this table! I got it for my niece as a housewarming gift and she sent me a picture of it set up in their new house and she was thrilled! It did take an extra week to get it to them because it was "lost" in transit (as she said, how do you "lose" a table! ), but, Overstock re-shipped it fairly promptly and it finally arrived. Great value, solid wood and sturdy! Table originally was made with good quality. It is hard wood and heavy which we wanted. But table was delivered in bad condition. Box was openned and kind of thrown at our front porch by the delivery lady. There are small damages on the corners and edge on one side. Easy to put together and it looks like the high-end tables that cost so much more. I have a lot of compliments on this table. Looks amazing and sturdy wood! You guys, this table is AMAZING!!! I absolutely love it... it looks and feels like I paid so much money for it- but I didn’t. It was very easy to assemble. Definitely keeping this for a longggg time! Love the live edge table because of the design, price and sturdiness. The only reason it did not get 5 stars is simply the first shipment came is damaged from the carrier. The replacement was still quick to arrive and OS customer service was great. "Is it a solid slab or are the table top and legs covered in a veneer?" The table is made in solid wood. "What is the dimension from the end of the table to the cross legs? I'm trying to determine if the ends are deep enough to have someone sit or if only the sides are usable." The distance between the end of the table to the leg is 5 inches. 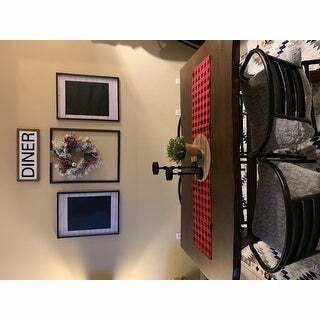 "This question is for “Lovethefarm13” : where did you find the chairs you have pictured with your table and bench (in your photos)? They are exactly what I am looking for with this table. Do your chairs fit comfortably at the ends of table? Thanks so much!" "What's the link for the bench? I just want one bench. Also do you know when it's going to be back in stock ?" The bench can be found here: https://www.overstock.com/Home-Garden/Simple-Living-Mandeville-Live-Edge-Solid-Wood-Bench/20345460/product.html We hope to have it back in stock in late January. "How many peoples will fit at this table?" I love the size and style.